Star Trek: The Animated Series (originally known simply as Star Trek but also known as The Animated Adventures of Gene Roddenberry's Star Trek) is a 1973 animated science fiction television series set in the Star Trek universe following the events of Star Trek: The Original Series of the 1960s. The animated series was aired under the name Star Trek, but it has become widely known under this longer name (or abbreviated as ST: TAS or TAS) to differentiate it from the original live action series. 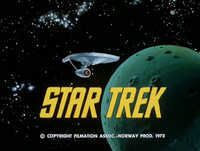 The success of the original live action series in syndication, and fan pressure for a Star Trek revival, led to The Animated Series from 1973-1974, as the source of new adventures of the Enterprise crew, the next being the live-action feature film Star Trek: The Motion Picture (1979). The Animated Series was the original cast's last episodic portrayal of the characters until the "cartoon-like" graphics of the Star Trek: 25th Anniversary computer game in 1992 as well as its sequel Star Trek: Judgment Rites in 1993. Both appeared after the cast's final movie together, Star Trek VI: The Undiscovered Country, released in December 1991. The Animated Series was critically acclaimed and was the first Star Trek series to win an Emmy Award when its second season won the 1975 Emmy for Outstanding Entertainment - Children's Series. This webpage uses material from the Wikipedia article "Star_Trek%3A_The_Animated_Series" and is licensed under the GNU Free Documentation License. Reality TV World is not responsible for any errors or omissions the Wikipedia article may contain.